This was my second reading of this book, the first being in 2005 when it was published. Since I was on my way to Turkey to speak to a number of Russian pastors about postmodernism and the emerging church, I thought it would be good to reread Carson. This is one of those books that proves to be more valuable as time goes on because what he says proves more and more to be right. 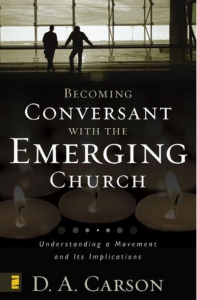 Since Carson wrote this book, many emergent advocates have written shocking books, especially Brian McLaren, Dan Kimball, and Rob Bell. In addition, the rise of “narrative” hermeneutics has also shown Carson’s warnings to be valid. Much is being written today on the emerging church, but Carson’s remains one of the best evaluations. It is thorough and insightful.